Special screening for Film Forum members and Scarecrow $100+ members only! Don’t miss out on one of the most important home video releases of 2016! 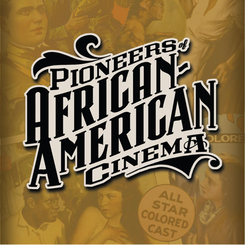 From Kino Lorber comes Pioneers of African-American Cinema, a monumental five-disc set representing the significant but long-overlooked achievements of early, independent African-American filmmakers. This collection includes no fewer than a dozen feature-length films and nearly twice as many shorts and rare fragments, with subject matter that includes race issues that went unaddressed by Hollywood for decades. Among the most fascinating chapters of film history is that of the so-called “race films” that flourished in the 1920s - ‘40s. Unlike the “black cast” films produced within the Hollywood studio (such as Stormy Weather or Green Pastures), these films not only starred African-Americans but were funded, written, produced, directed, distributed, and often exhibited by people of color. Entrepreneurial filmmakers not only built an industry apart from the Hollywood establishment, they cultivated visual and narrative styles that were uniquely their own. Defying convention and operating outside the studio system, these filmmakers were the forefathers (and -mothers) of the French New Wave, the L.A. Rebellion, and the entirety of American indie cinema. Previously circulated in poor-quality 16mm prints, these newly restored versions allow us to witness the legacies of Oscar Micheaux, Spencer Williams, and James and Eloyce Gist with fresh eyes - proving that, anything but imitative, these pioneers were purely innovative. UW Professor Louis Chude-Sokei and critic Robert Horton will be in attendance to discuss these rare, long-thought-lost films. This event is for Film Forum members and Scarecrow $100+ members only! To learn more about membership at Scarecrow Video, please visit this link.